Do you manage a restaurant near Playhouse Theatre? Click here to contact us and get listed. 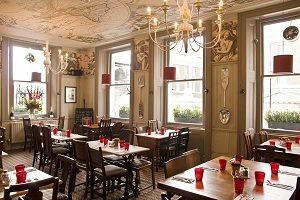 A hearty array of classic British dishes served in a charmingly British style gastro pub. Classic dishes on offer include fish 'n' chips, ploughmans and an array of pies. Desserts are similarly traditional with sticky toffee pudding, apple crumble and British cheese on offer. All food is cooked fresh to order and there is usually a selection of daily specials to choose from. Draught beers brewed in Greenwich are available alongside an extensive wine list and various real ales. Food is moderately priced at around £13 per main dish and there are also lighter bites available such as scrumptious sandwiches at around £7 each. Call 020 7930 4808 for reservations and further information. Good Ship Benefit at R.S. Hispaniola is a floating restaurant! 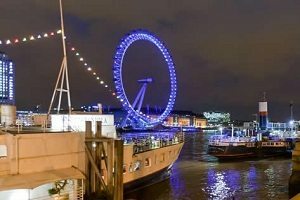 Positioned directly opposite from the London Eye, the views from this from this vessel cannot be beaten, and the atmosphere makes for an entirely unique dining experience. R.S. Hispaniola offer a pre-theatre menu (bookings available from 5.30pm to 6.15pm)with a guaranteed one-hour turnaround time, offering 2 courses for £22. We’d recommend getting there as early as you can so you’re not feeling rushed on your way to the theatre. Three options are available for each course, and while all looked excellent, we’d recommend the ham hock terrine, the perfectly cooked and seasoned chicken, and the deliciously delicate banana parfait. Call 020 7839 3011 for reservations and further information.